The Wagner Heavy Coat 750 E (Electric) + SSP Spray Pack unit is part of the Heavy Coat Hydraulic Piston Pump range, equipped with shovel piston for enhanced performance. Ideal for high viscosity materials, multi-gun use and working at heights. Sprays bituminous and fire retardant products, amongst other heavy materials. 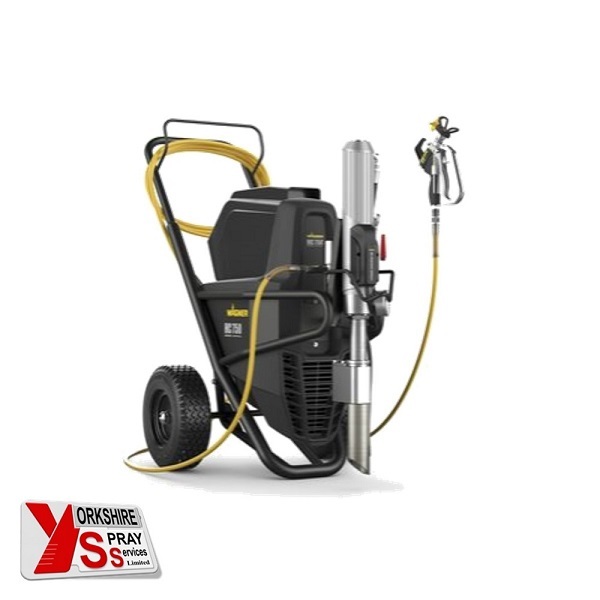 The Wagner Heavy Coat 750 E (Electric) + SSP Spray Pack is part of the Heavy Coat Hydraulic Piston Pump range. Ideal for high viscosity materials, multi-gun use and working at heights. Sprays bituminous and fire retardant products, amongst other heavy materials. The material pump of the Wagner HeavyCoat units is driven indirectly by hydraulics. The high suction power improves the application of high viscosity materials. The low wear rate and the resulting long service life of the equipment are further positive aspects of hydraulic technology. The wear surfaces of cylinder and piston rod are coated with an extremely wear resistant layer of hard chrome, making them able to withstand aggressive and abrasive materials. The patented SSP System from Wagner is a unique development for the application of high viscosity materials, spraying plasters, adhesives and bituminous paints. Thanks to the special design of the system, the pump is continually filled with sufficient paint material by the shovel piston. It is possible to work without pulsation or malfunction with Wagner’s “Special Spray Power” available for both HeavyCoat units. Decide yourself how much performance you need. With a choice of either a electric or petrol motor. Fast container changeovers, easy to clean and transport thanks to the swivelling Swing Cart pump unit etc. Equipped with shovel piston for enhanced performance (SSP). The perfect choice for large areas and intensive usage. Long Service & Reliability – thanks to new Hydrastroke technology, the operating temperature is significantly reduced, thereby increasing the service life. New Hydraulic Design – inspired by mining and aviation for the toughest demands in terms of the piston pump‘s working and delivery performance. Powerful – constant performance for the application of heavy, filled and high-viscosity materials such a bitumen and textured plaster over large areas. Superb Performance – perfect surface results, even with long hoses. Versatile & Durable – for demanding construction site use. Maximum – user-friendliness thanks to simple operation. Innovative HeavyCoat product features: either a petrol or electric motor. The Heavy Coat Piston Pumps. Ideal for large residential, commercial & maintenance applications.